Whatever is funny is subversive, every joke is ultimately a custard pie…A dirty joke is a sort of mental rebellion. Reality exists in the human mind, and nowhere else. Not in the individual mind, which can make mistakes, and in any case soon perishes: only in the mind of the Party, which is collective and immortal. If there is a wrong thing to do, it will be done, infallibly. One has come to believe in that as if it were a law of nature. If you set yourself to it, you can live the same life, rich or poor. You can keep on with your books and your ideas. You just got to say to yourself, "I'm a free man in here" - he tapped his forehead - "and you're all right. All Spaniards, we discovered, knew two English expressions. One was "O. K., baby", the other was a word used by the Barcelona whores in their dealings with English sailors, and I am afraid the compositors would not print it. As for [Stanley] Baldwin, one could not even dignify him with the name of stuffed shirt. He was simply a hole in the air. How right the working classes are in their "materialism." How right they are to realize that the belly comes before the soul, not in the scale of values but in point of time! Only old Benjamin professed to remember every detail of his long life and to know that things never had been, nor ever could be much better or much worse—hunger, hardship, and disappointment being, so he said, the unalterable law of life. Has it ever occurred to you,' he said, 'that the whole history of English poetry has been de-termined by the fact that the English language lacks rhymes? The truth, it is felt, becomes untruth when your enemy utters it. 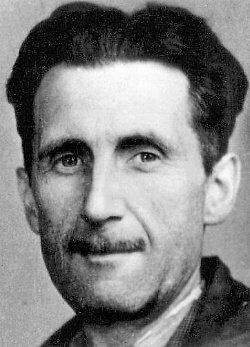 Bio: Eric Arthur Blair, who used the pen name George Orwell, was an English novelist, essayist, journalist and critic.